Police battling the current crime wave say they have arrested two men who staged daring holdups on the Ascot Park and Eastlake streetcars, robbing the motormen and conductors as the cars reached the ends of their routes. These holdups had so infuriated local officials that Chief Kern armed bicycle officers with shotguns and ordered mounted policemen to resume patrolling the city. 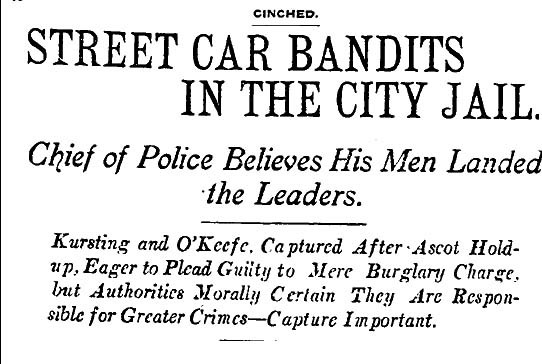 In each case, robbers waited at the end of a streetcar route, when the trolley was empty except for the motorman and conductor, overpowered the men and robbed them. The bandits only took money or guns.